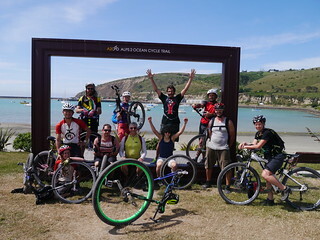 We started back on the Alps to Ocean trail to Omarama, one of the nicest sections of the trail. 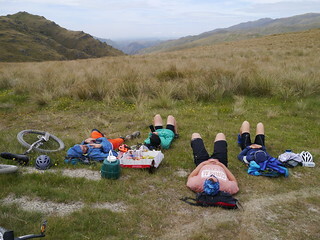 There was a nice climb followed by an equally epic descent to Otematata for lunch and a dunk in the Lake. After that we climbed up the steep road up to the Lake Benmore Dam- an impressive sight once at the top. 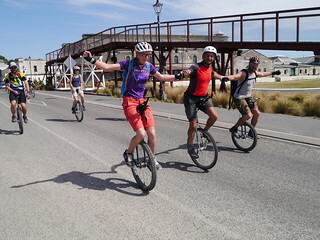 It’s hard to know if we are the first unicyclists to ride across the dam, but we are very likely the largest ever group of unicyclists to ride across the dam! From there we rode along Lake Aviemore to the Aviemore Dam. Our driver Said had found us a nice swimming hole under a tree, which was a nice place for afternoon tea. We also took quick hike up the Deep Stream Walk to a secluded river valley (and had another swim), before riding the last section to Kurow. 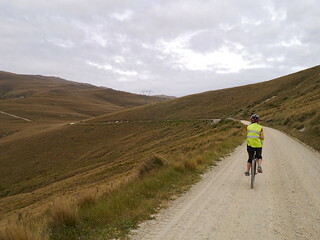 Todays ride would take us on a long gradual climb up to 900m at Freehold Creek. 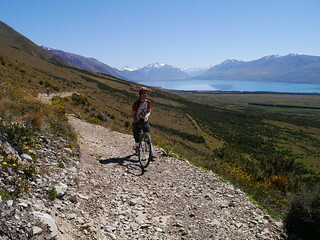 It was a well groomed path that had magnificent views across the basin to the Ben Ohau Range. The day got progressively hotter and many riders dunked themselves in the stream crossings to cool off. After the top it was a fast, fun descent to Quailburn road where the support vehicles met us. 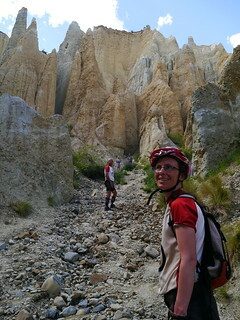 After some much needed rest and shade, we headed off to our next destination, Clay Cliffs. 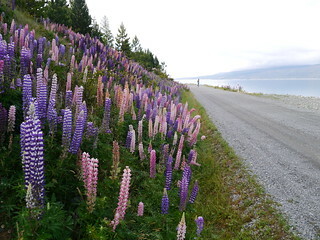 The road was lined with colourful lupins as it crossed the lush green farmland. 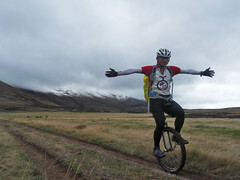 We had a lot of fun riding on the loose gravel with the unicycles at times sliding around underneath us. Lunch by Clay Cliffs was quite a treat. Anna had gone ahead in the support vehicle to prepare our- lunch under a tree when we arrived, with yummy couscous salad . After lunch we hiked up to the magnificent sandstone formations at Clay Cliffs, before heading back to the road and out to Buscot Station, where we were staying tonight. The best thing after a hot day riding…ICE CREAMMM!!! We had two big tubs waiting for us when we arrived, thanks to Anna! We spent the evening chilling out in the beautiful garden at Buscot Station, and Sean entertained us on the Piano. 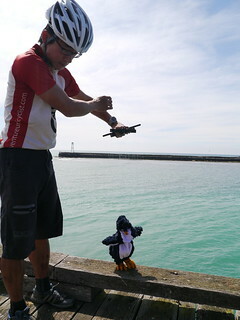 I flew down to Christchurch on Labour Weekend to meet up with Anna, who had been busy performing puppet shows in Christchurch. 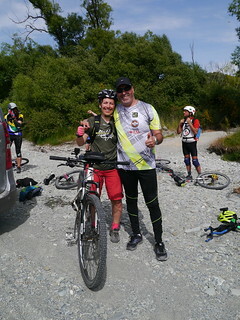 She had been telling me about the Alps 2 Ocean trail for the best part of the year, so we finally decided to do it together during her South Island Tour. 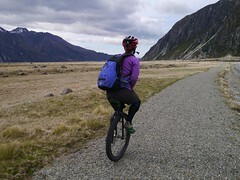 The new 300km trail is part of the NZ cycleway, and takes you from Mt Cook Village to east coast of the South Island. 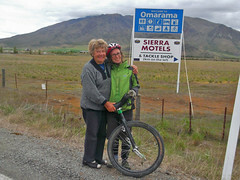 We were also going to visit Anna’s nana, who lives in Twizel, in the middle of the A2O trail. 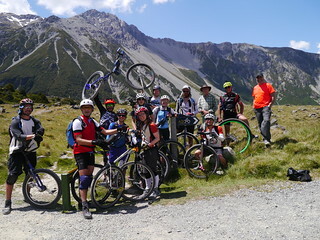 Our plan was to complete the first half from Mt Cook Village to Omarama. 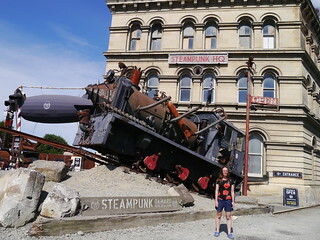 It was the first time I’d been to Christchurch since the earthquakes, so after Anna picked me up from the airport we went to the city centre to have a look around. We walked through the square, gazing at the ruins and new construction. The last time I was at Cathedral Square was on our 2007 South Island Unicycle Tour, so it was quite sad to see so many buildings demolished or damaged by the quake. We had lunch at the new mall next the square, which was built out of shipping containers. 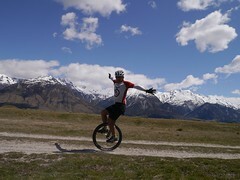 After a quick stop to pick up riding supplies at the Cookie Time factory, we set off on the picturesque drive to Twizel. We arrived at Nanas house but she was out playing golf, so we were greeted by her Great Uncle Alec who had driven down in his camper van from Tauranga. 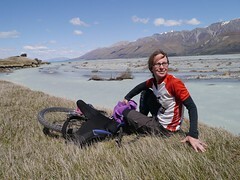 Anna showed me her childhood hangouts in Twizel, then we picked up fish and chips to fuel up for tomorrows ride. “We’re doing what?!! !” Anna had slightly mistaken the geography of the area. 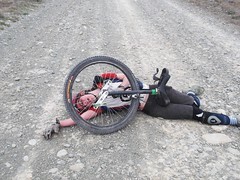 Instead of a comfortable 60km ride she’d planned for our first day, it would be a 74km ride to Lake Tekapo, followed by a 94km ride to Lake Ohau the next day. 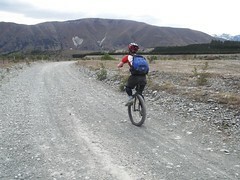 We were starting on the regular A2O ride, but cutting across to the alternate start at Lake Tekapo. Luckily having Twizel on the trip route meant we could start in Mt Cook Village and finish at Nana’s place later that day. 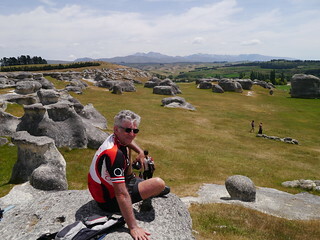 It would still be a challenging ride, as we would be completing two sections in one day. Uncle Alec drove us in his campervan to the start of the A2O trail at Mt Cook Village. 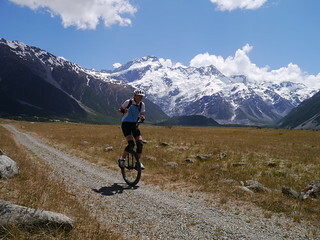 From there the track starts off fast and flowy, a scenic 8km trail to Mt Cook Airport. This was more helicopter landing pad than airport, as the chopper is the only way across the river unless you fancy an icy dip. The all too brief 2 minute ride gave amazing views of the mountains and river below. It dropped us off at Tasman Point, before ferrying other passengers to the glacier. 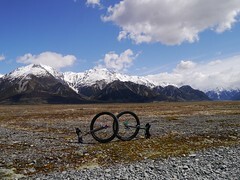 From there we cycled toward Lake Pukaki, following the Tasman River, and had lunch of peanut butter sandwiches along the riverbank. 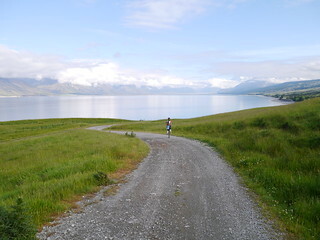 Once we hit Lake Pukaki the track turned into a gravel road, with the Southern Alps seeming to rise above it. The lake is an amazing shade of blue, photos don’t do it justice! Half way down the lake we stopped at Braemar Station to fill up our drinkbottles, much to the bemusement of the farmer and his son. It was getting really hot so we considered cooling off in the lake. Although it was a warm day the lake was anything but! After dipping our toes into the glacier fed waters we decided a swim was not on the cards. By the time we arrived on the final stretch to Twizel, the sun was setting. Anna was getting tired so we finished our ride at the dam. Anna’s Nana picked us up and drove us back to Twizel to stay the night. 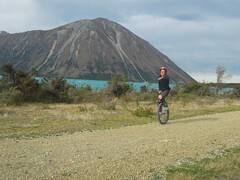 The next day we got up bright and early and started back at the Pukaki dam. 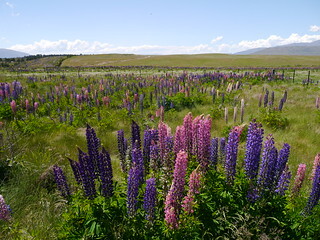 The first part of the track meandered through dry grasslands typical of the MacKenzie Basin landscape, the ‘Pukaki flats’. 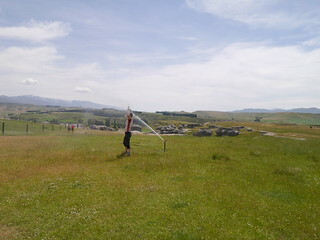 It took us back to Twizel but we bypassed the town by taking the alternate ‘flood’ route. Anna wanted to show me Lake Ruataniwha, where she had spent many childhood holidays. 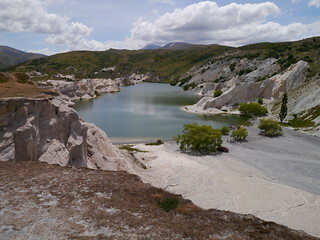 It is an artificial lake created by another massive dam; part of the Waitaki Hydroelectric project of the late 1970’s. There was a Salmon farm by the dam. We stopped to have Salmon Pie, Salmon Chowder, and then fed the fish which would one day become someone else’s lunch. The gravel road after that was incredibly rough and it was a struggle for Anna, who kept bouncing off the rocks. It was getting very late by the time we reached the Lake Ohau Weir. 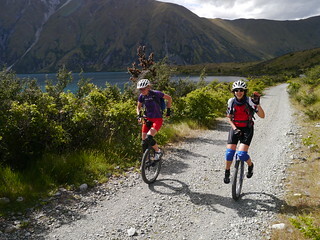 The wind was starting to howl, but the fast flowy track and amazing scenery of Lake Ohau made it worthwhile. At the end of the track we were picked up by Tony, a retired farmer from Buscot Station who now runs their backpacker accommodation. He entertained us with tales of farming in this region and the challenges they faced. We watched him feed baby lamb and then cooked up pasta for tea. It was a drizzly morning but Tony dropped us off at Lake Ohau lodge, where we warmed up by the fire, hoping for the weather to clear. A couple of mountainbikers had decided to cancel their ride because of snow at the top of the ridge, but we had to get going regardless. Luckily it wasn’t as bad as we thought. 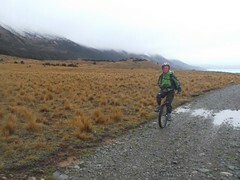 Our ride started with a gentle 10km climb, but the drizzle had simply turned into mist. The landscape was quite different to the day before, with a light dusting of snow on the mountains. 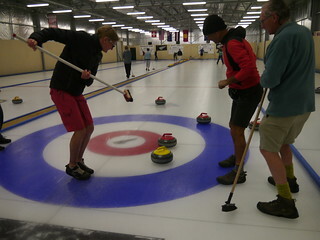 The track summit was just at the snowline. Anna copped a couple of snowballs as she arrived at the top. 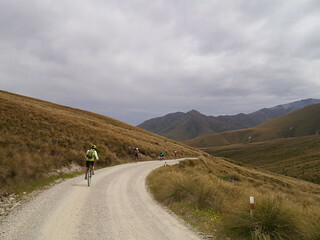 The 18km descent took us to Quailburn Road. 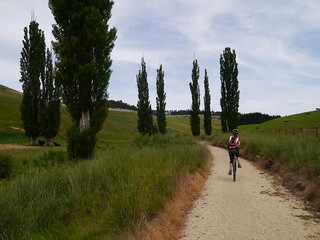 The gravel road then takes you through farmland for another 35km…before a turn off to the ‘Clay Cliffs’. We decided not to take the detour as it was getting late….maybe next time! 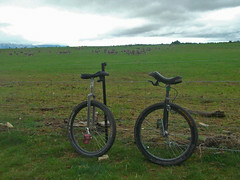 The ride finished with a short singletrack to Omarama. Nana picked us up again and drove us back to Twizel, having completed the first four sections of the Alps to Ocean trail.